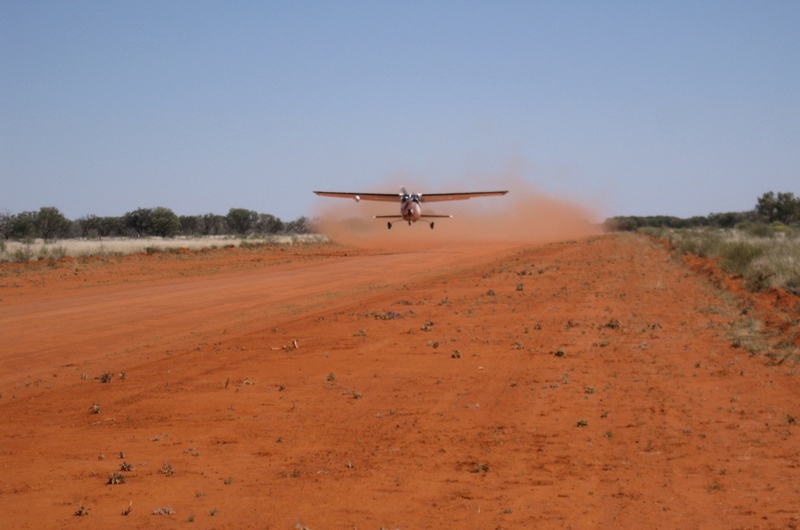 Maintenance of airstrips – just another job! 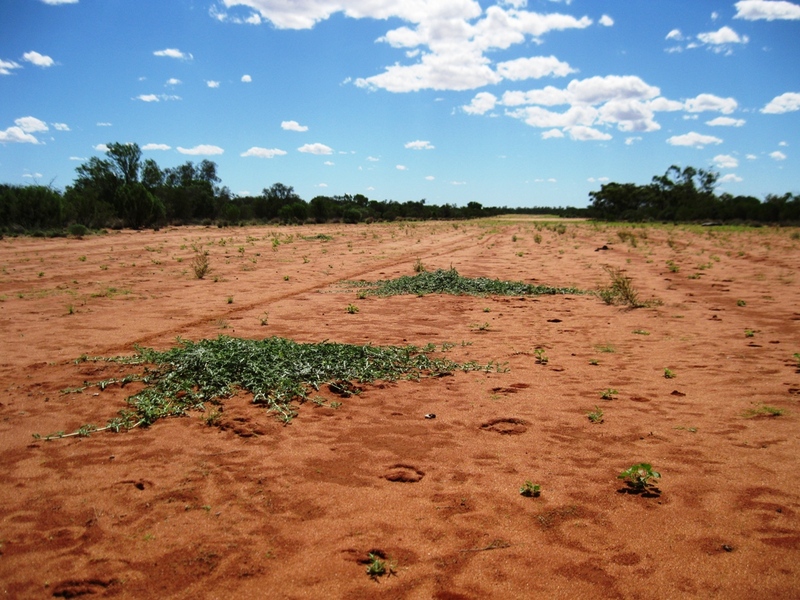 Looking down our longest airstrip, most of those little plants are woody weeds. 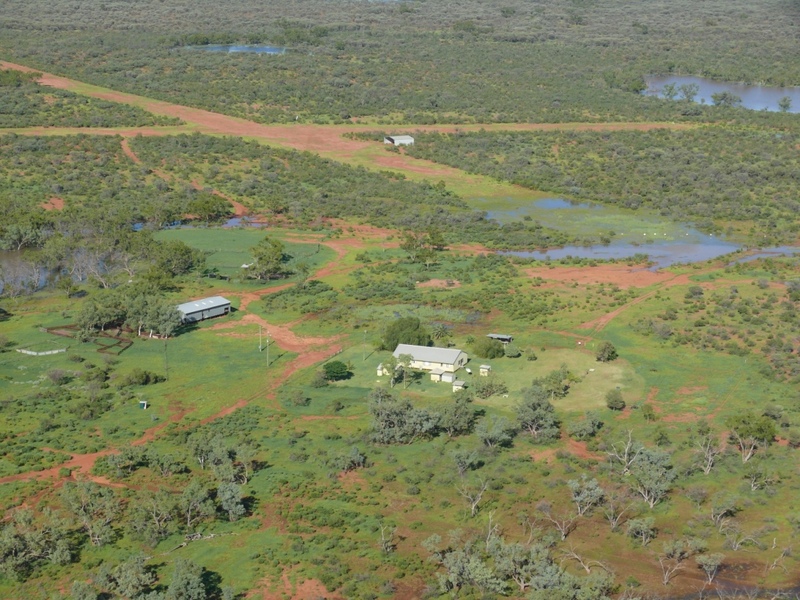 Not long after Greg and I tied the knot in 1980 we did the prudent thing and put an airstrip in – it was about 900 meters long, wide enough and did us well enough for the first 10 years or so. Then we decided to learn to fly and buy a plane, so a second strip was put in – a cross strip for the first one. This one was 1200 meters long and very wide, to really comply with RFDS standards. Now both of these airstrips are in the most mongrely sandy country and 10 mls of rain renders them unusable, but that’s where they are and that’s where the hangar is so that’s that! We have put another on in about 10 kilometers from the house on much better country and so far I have used it a couple of times and visitors have used it as well. It’s east – west and about 1300 meters long. But back to the original ones, when we put the second strip in I had this 1200 meters by about 30 or 40 wide to pick up sticks from! So every day I would put an hour or two in marching up and down with a rake and buckets doing the stick trick. Our two girls were aged about 8 and 6 and woe betide them if they ever said they were bored or had nothing to do! Off we would go to the airstrip, picking up sticks, telling stories and making up riddles to jolly them along! Also our flying instructer seemed to have a hatie on the big long strip and even if the wind favoured it, he would often insist we land on the shorter one. I think it was because it was so long we really didn’t have to try too hard to land in the first quarter of the strip and pull up in a timely manner. We could just plonk her down halfway along and still have stacks of room in front of us. They like to make things hard for the poor little trainee! But still my first solo flight ranks right up there in my top 4 life experiences! NEVER forget your first solo, do you? Just looking over at that seat next to you, that is empty, makes you feel very alone! But the maintenance of our airstrips is never ending. We very rarely grade them as the country is too sandy and we would just end up with an enormous gully, but we do drag them with an assortment of things – old steel, wagon wheel rims are the best thing. We try to do this just before it rains, so that they “set” nice and hard. But as often as not it doesn’t rain and all we get is wind and then it’s heartbreaking to see the airstrips just blowing away and the more this happens the lower they get compared to the surrounding country and erosion by both wind and water is a very real problem. Also during very dry times we can’t let visitors use the strip as they would more than likely bog their planes in the dust and dirt. I still use it but my plane is very light and I know just where to go and where not to go on the airstrips! After we get rain the woody weeds and the paddy melons come up all over both of them, so I’m out there with axe, shovel, and poison trying to control them ( kill them!!! ). And that’s where I am at right now, there are gazillions of little woody weeds out there that I have to eliminate. The smaller they are the less poison I’ve got to use ( it’s very expensive ), it’s just finding the time to do the enormous job which is difficult. What to do with all this home grown stuff? Along with the joys of harvesting my own fresh veg and some fruit comes a bit of a reality check! I’ve got to process all this stuff! For instance for a good part of the last year we have been having a bumper tomato crop. 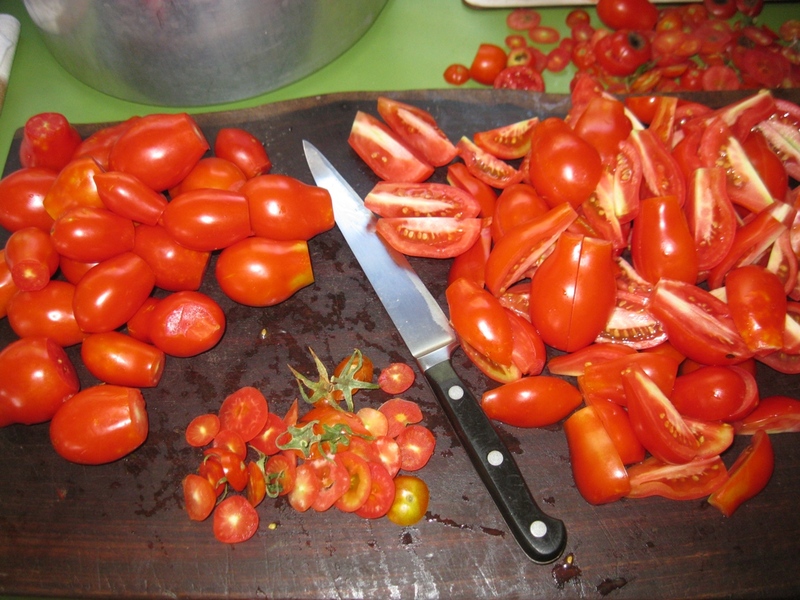 Now we really appreciate a good red, ripe, tasty tomato as opposed to the things we buy at the shop – all they are good for is slicing and putting on the top of the macaroni cheese just so you have something red there. Come to think of it paprika does a better job! So along with tomatoes in the salad and grilled tomato for brekky, the gravy, stews and curries usually have a tomato or two lurking in there. They are also good on top of the roast to stop it drying out, I’ve made many a batch of tomato soup, Bolognese sauce and I tried drying some and putting them in oil but they were too crunchy. Don’t know what I did wrong there. 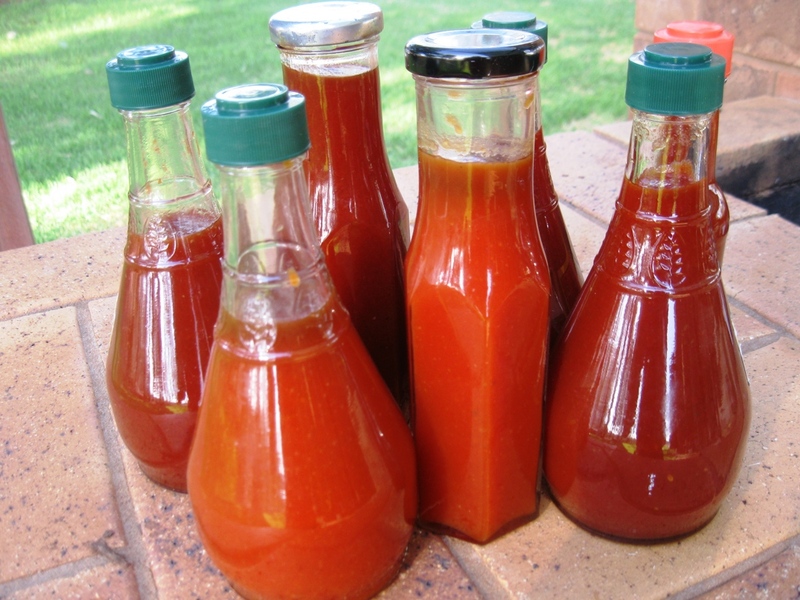 The pantry is now home to many bottles of chutney and tomato sauce and a neighbour friend told me that you can simply freeze whole tomatoes for later use in stews, so there are quite a few boxes of tomatoes festering in the bottom of the freezer. We’ve also had a lot of zucchini and squash. As we speak I have thinly sliced zucchini and onion draining in a colander in the cold room, ready and waiting to be made into pickles. We’ve had zucchini slice, zucchini fritters, stuffed zucchini and zuchs in the stews and curries. Any other ideas folks?? They are mounting up in the coldroom! I’m managing to keep up with the eggplant – but only just. They are the little long skinny ones and have been delicious – even the horrible white grubs think so. 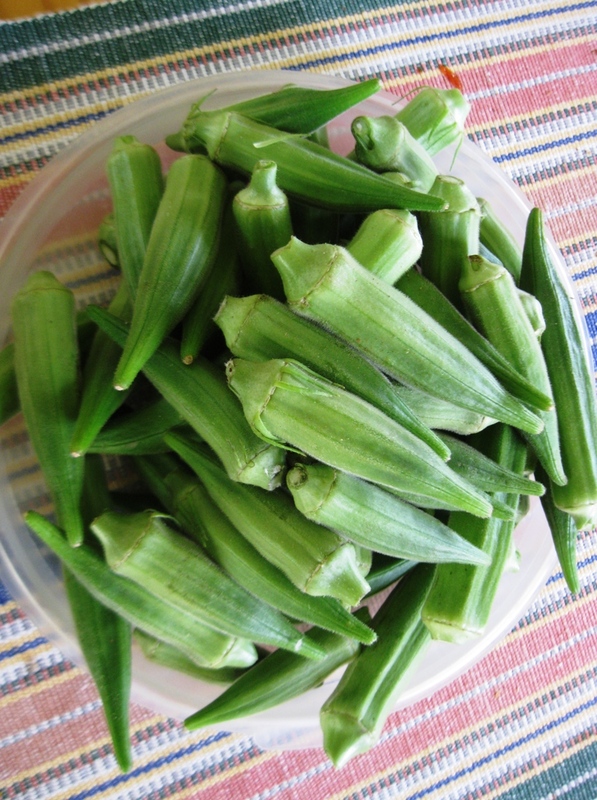 But I think I am going to be snowed under by the okra. There are about a dozen okra bushes, I dotted them all about the veg garden to provide shade for other plants and they are really starting to produce! They go into the stews and curries too and I fry them up with lots of different herbs and spices and we have them both hot and cold. I’ll hit the internet for some new recipes for the okra I reckon. And lastly the fruit – well we haven’t been drowned in it, but we could be if 8 large watermelons all get ripe at the same time! One melon busted open when the temperature reached 48 last week, luckily I was present, rescued it and popped it into the coldroom. It’s a very nice, tasty 6kg melon. How do you know when to pick them!!! I know they should make a drummy sound when you tap them – but they all sound sort of drummy. And yesterday I picked a 9 kg one, will cut it open today, fingers crossed it’s going to be yummy! Then there are the rockmelons, they too suffered in the heat and the chooks ended up with 3 last week, (they sort of just cooked inside). But there are more that I have high hopes for, picked 4 good sized ones this morning and ate one for lunch! As cattle producers we are eating more F&V than lean beef and my halo just might choke me. Even Greg, when confronted by all the nice salads that I am making, eats more vegetables than meat these days! Delicious Okra from my garden. Self sufficiency down on the farm. Whoops, I mean Station!! Our eldest doing the mincing, no electrics here! During a recent “cool spell “we went and got a killer. By this I mean the freezer was nearly empty and so we drove out into the paddock, selected a fat little Hereford heifer who wasn’t a particularly good sort, shot her and cut the meat off her. The Hereford’s eat so much better than anything with Bos Indicus in it. In our opinion!!!! Probably got a lot to do with what they are eating themselves. We then loaded the meat onto old shearers stretchers on the back of the Toyota and brought it home and hung it all up in the coldroom. Very satisfying to see the shoulders and the back legs, the rumps, sirloins, rib fillets, neck, briskets and the rib bones all hanging up waiting to age a little, then to be cut up a little more and bagged and then into the freezer. It also occurs to one that one is going to be doing a lot of butchering in the next week or so. With those blunt knives. The magpie family is happy as there are lots of scraps for them and the 2 little dogs are beside themselves with the smell of all that divine beef. They are heartily sick of Chum and My Dog! The big dogs can also expect some delicious bones and scraps. It really hurts the hip pocket when we have to buy meat and sometimes we do for various reasons. We make up a big tub of brine to corn the meat in ( silverside, sometimes some rib bones, brisket etc) this lives in the coldroom for about 10 days, long enough to cure the meat. 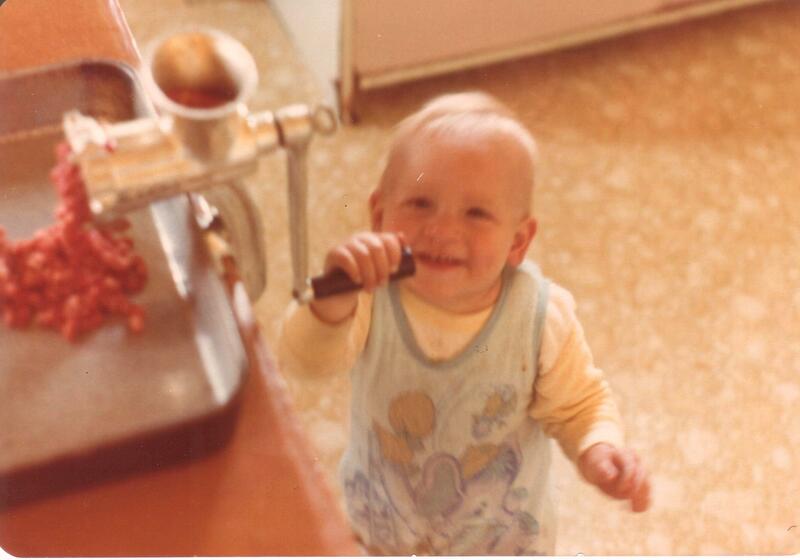 We mince certain cuts (with an electric mincer) and also make sausages and rolled roasts. The shin is diced for stewing meat, some cuts are used for crumbed steak and so we are right for meat for about the next 6 months. It’s a far cry from when Greg was a boy and all they had was a meathouse to store the meat in while it cooled down and a couple of Kerosene fridges. Then if they killed a beast it was only ever in the winter and after about a week of having fresh meat they had to salt the rest as the only method of preservation. The meat was cut into chunks of about 1 or 2 kilos rolled in salt and kept in corn bags in the coolest place they could find. Sometimes hung up in trees. It also had to be inspected every day to make sure that the flies or ants hadn’t found it, sometimes they would wash the meat and resalt it. I reckon you would get fairly sick of eating corned meat all the time! Occasionally they would buy a sheep off a neighbour and kill it for a change in their diet – nice leg of roast mutton would have been a real treat! Back then meat was the staple in the diet; veg consisted of potatoes, pumpkin and cabbage and maybe some carrots. Salads were a bit suspect – the ingredients for them were very hard to obtain anyway. With the exception of tomatoes and onions the rest of the “Salad” usually came out of a tin: beetroot, peas, corn, bread and butter cucumbers, and for special occasions – asparagus. Oh, potato salad was also very popular! Sometimes there were fresh vegies if they had a vegetable garden going, but back in the 50’s and 60’s Australians were a very conservative bunch – there was no multi cultural stuff happening in the food department out here and not much in the cities either unless you happened to have a Greek, Italian or Lebanese for a friend. So what did they grow in the garden? Tomatoes were prized as was lettuce and cucumber and then there were the old staples – pumpkin, carrots, silverbeet, beans, peas and beetroot. It was still very much like this when I came out here in the late 70’s, but we did have a large gas freezer that we checked twice a day to make sure it was still a goer and there were no bits of fluff around the naked flame underneath it. At least we were now able to freeze the beef instead of salting it. And we did have a great vegetable garden too when we lived in the Shearers Quarters and also when we first built our house and now I have another one. Back at that the Shearers Quarters! We probably still eat more meat than the urban population but it is about 35 % of our diet now not the 70% that was once common. That’s in my household anyway! Not the same everywhere I’m sure. Our little old meathouse at the Shearers Quarters. The thriving town of Thargomindah on the Bulloo River. Thargo just never seems to look back, its workforce works mainly for the local council or one other entrepreneurial business in town and it’s a little town that just keeps growing and growing in both size and population. 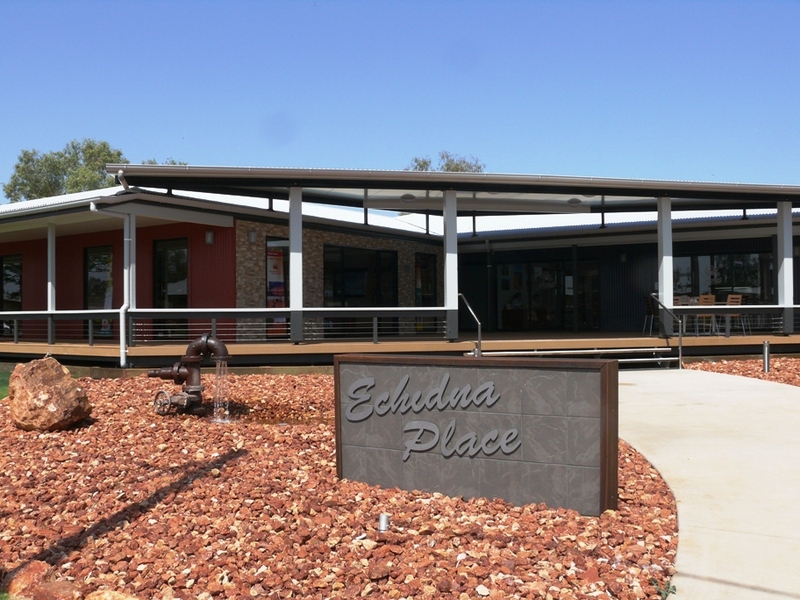 The streets get bigger, the footpaths get wider, more and more lovely little houses get built, there are 2 caravan parks, a pub, a motel and restaurant, the community centre, a Toyota dealership, a roadhouse and lots of other businesses. 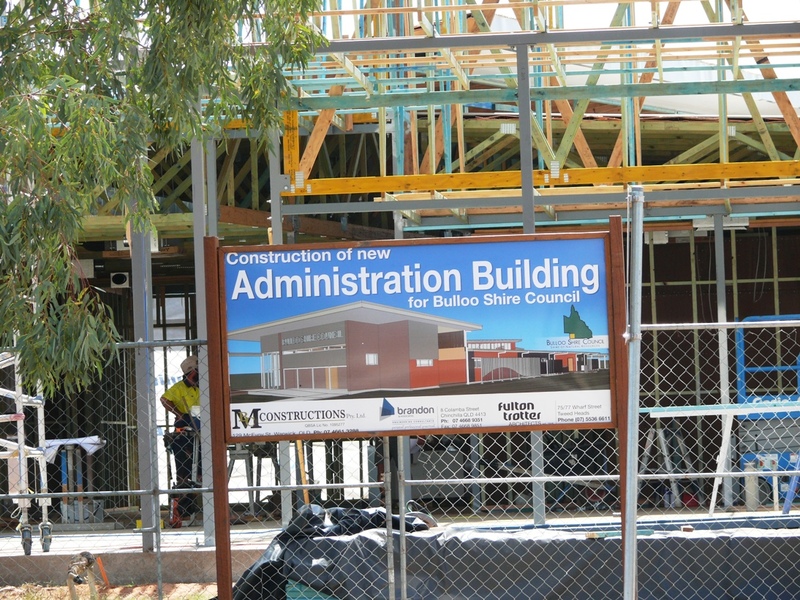 And now the Bulloo Shire is building a new Administration building and has just recently completed the new visitor information centre, library and coffee shop. Another 25 blocks of land are also to be developed and put up for public tender in the near future. 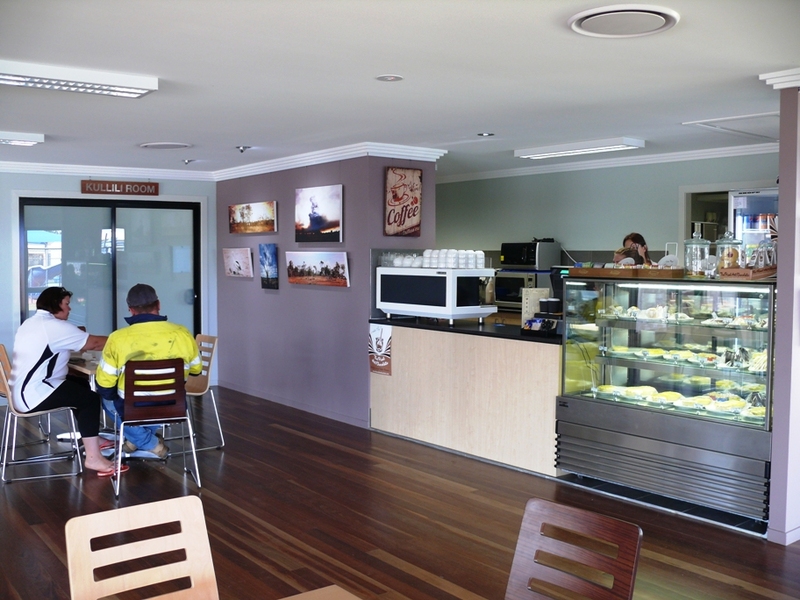 It is an interesting town where visitors can see lots of dogs, horses, some nice old buildings, a demonstration at the older town bore, have a great coffee at the new shop OR one of the best burgers you’ll ever eat at Fergies Roadhouse! The locals are generally friendly and helpful, showing typical outback hospitality to nice visitors. A great feature of the town is also the colourful display of flowers in the middle of the streets and around some of the buildings. 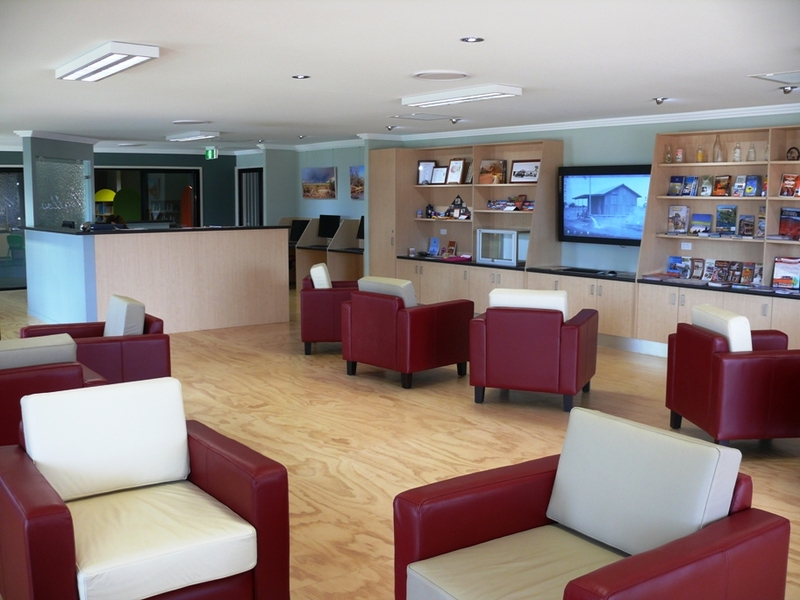 The visitor info centre has plenty of comfy chairs! The VIC is a bit light on for info still but I was told they are waiting for some more shelving to arrive so as to put more stuff out. A little observation from me, the girls at this new center were lovely and obliging but they all would look soo much better in some sort of uniform! NOT cut off jeans, T shirts and thongs. Just a bit smarter to reflect their surroundings. The Great Artesian Basin – we’d be sunk without it! The most important bit of water infrastructure a station can have. 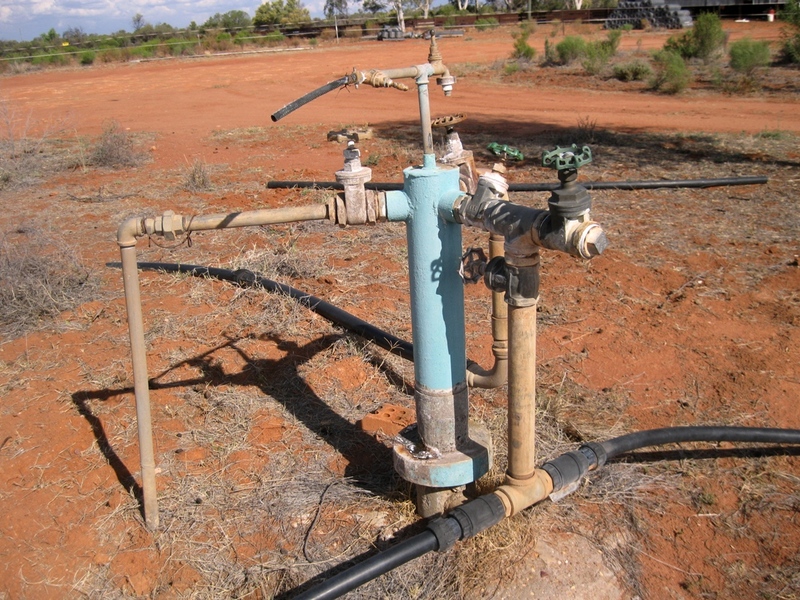 As you would be aware water is vitally important to us who live in the more arid parts of Australia. I know it’s important everywhere, but city people do tend to take water for granted except when water levels in dams start making the nightly news. Not only do we need to take particular care of our stock watering points but our bore water needs special consideration if it is going to do the job domestically too. The capped artesian bore situated at our Shearers Quarters was put down in 1962 , the depth is 368 meters , it comes out of the ground at 47 degrees at a rate of 79,200 gallons per day with a pressure of 51.5 PSI. I know the mixture of imperial and metrics is quaint, but that’s the way it is! 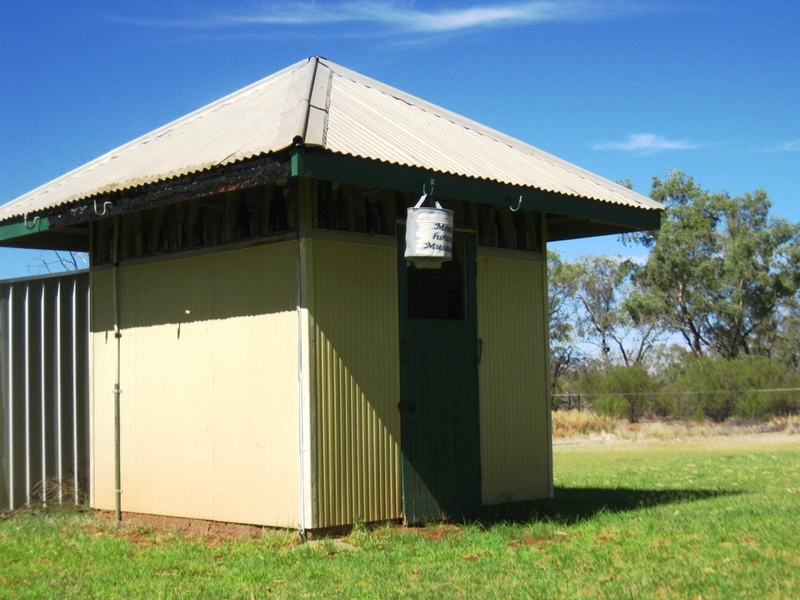 Now in summer that’s way too hot to comfortably have a shower under, so there is a big roll of poly pipe, full of water, underneath the Shearers Quarters that is then attached to two cold taps in one bathroom. So the first ones to have a shower do get a nice cool one, subsequent bathers will find that the water gets hotter as the pipe refills constantly. During winter, guests at the Quarters are asked to water the lawn before having their showers! It gets the water moving through the pipes so they can then enjoy the therapeutic benefits of the 47 degree hot artesian water. It’s a different story at the homestead which is a mere 1.5 kilometers from the bore. Water to the house is piped up from the bore in more poly pipe which is buried in the ground about 2 feet down. During summer the water is far too hot to shower in despite the pipe being buried, so we have a 500 L cold water tank with a pressure pump attached to it so we can have a cool shower. In winter we have a solar hot water system because as the pipe is buried the water is cold! In winter only. Also in summer when I need lots of water for my garden I find that I have very little pressure or water as the cattle in the next 2 paddocks are slurping away at the water in the troughs. The outback would be a ghost place if anything were to happen to spoil or contaminate the water of the Great Artesian Basin. Not only would there be considerably less water for the kangaroos and wallabies, the sheep and cattle industries would be decimated and places like Kilcowera would be unviable and not worth living on. Hundreds of thousands of people wouldn’t have jobs as many outback towns depend on the water from the GAB as well.